The first question to be discussed is – why is the International Tennis Hall of Fame in Newport, Rhode Island? The answer has to do with the fact that tennis originally was one of the “country club” sports – usually played by the rich and famous. Golf is the other. And back in 1880, the Newport Casino opened to serve the recreation needs of the elites, who flocked every summer to Newport. Within a year, the United States Lawn Tennis Championships were held at that spot. That tournament eventually moved to New York in 1914, and it became known as the United States Open. You may have heard of it. But that “country club” feeling still oozes around the grounds, which are tucked behind some storefronts along one of the major streets of downtown Newport. That’s partly because of the grass courts that are sprinkled around the grounds; a tournament is still held here for pros every summer as part of the annual induction ceremony week. But it’s also because the buildings would feel at home from that era. In other words, it’s fun just to walk around the complex. One of the main courts greets visitors on the way in. It is surrounded on three sides by a regal-looking building, and that’s where the Hall of Fame is located. 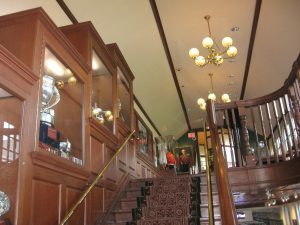 After paying admission, guests walk up expensive-looking stairs (lots of wood) and see lots and lots of trophies for tournaments recent and ancient. The tour then works its way around the rest of the building. Each of the 252 inductees has a picture attached to a small display. As you’d expect, there are plenty of old racquets behind glass cases along the way. The various eras of tennis get rooms for display purposes. Besides trophies, there are clothes, magazine covers, etc. The famous match between Billie Jean King and Bobby Riggs is well covered here. Roger Federer chips in as a hologram in one area, in which he talks about why he loves tennis. After finishing a walk through the Hall, visitors are free to take in the grounds. It is a working tennis facility, so people can reserve a court or take lessons – which must be very high on the list of cool things that a tennis player could do. And the architecture of the buildings is classy and superb throughout. About the only complaint that someone could have with it all is that there isn’t a great deal of space. They do a good job with that they have, and the tradition involved in the game is one of the main attractions. But it’s fair to say that the best such museums have plenty of space for a wide range of exhibits, and this one falls a little short. I’m more willing to forgive the location, which isn’t exactly on Main Street. Yes, Flushing Meadow in New York might be more accessible for a Hall of Fame for tennis fans, particularly during the U.S. Open weeks. But Cooperstown, Canton and Springfield aren’t exactly located in major metropolitan areas either. It’s nice to have an historical connection between place and subject, and Newport works perfectly in that sense. Admission is $15, with the usual discounts available for senior/student/military visitors. Newport’s major attractions are the huge mansions from the “Gilded Age” of the 1890s or so. But the Tennis Hall of Fame gives visitors something else to do in the area during a visit. If you’re in the neighborhood and go, you’ll probably like it.